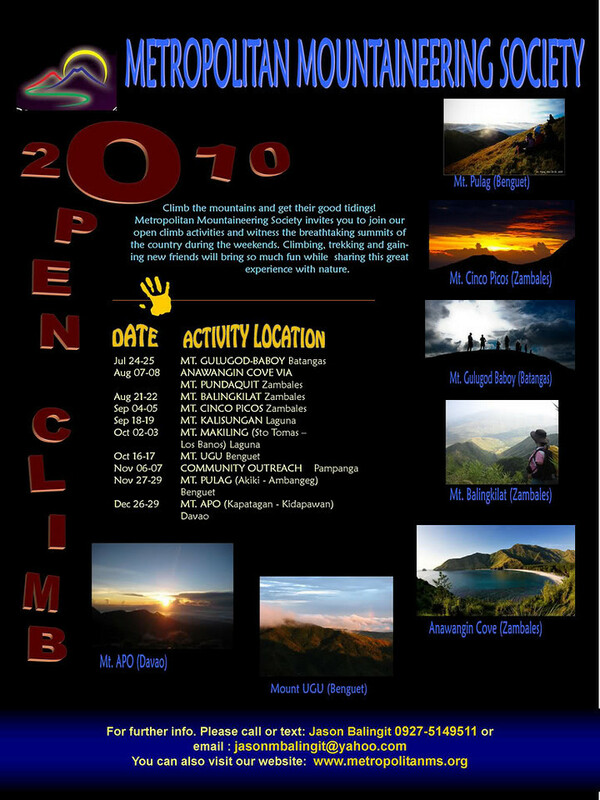 Metropolitan Mountaineering Society has just released its open climb schedule for the rest of Year 2010. Take some time away from the metal buildings of the city and breathe clean air, enjoy quiet and meet new friends in their open climbs. The destinations include Mt. Gulugod Baboy, Mt. Pundaquit, Mt. Balingkilat, Mt. Cinco Picos, Mt. Kalisungan, Mt. Makiling, Mt. Ugu, Mt. PUlag and Mt. Apo (in December to boot!). MMS is very strict about the Leave No Trace way of life but it has never hampered mountaineers from having fun.